Delicious, Hunger Blocking Weight Loss Bars You Can Actually Enjoy! Nutrition is extremely important when trying to lose weight. Keeping up on your weight loss goals can be hard, especially if you are busy and just don’t have time to prepare your meals and snacks. Granola bars or protein bars are an easy go-to when you need a quick snack to fill you up. Sadly, a lot of snack bars aren’t built to keep you feeling full while supporting your weight loss goals. Snack bars can also be full of carbs, fat, sugars, and calories that you don’t want in your meal plan! Because the nutrition isn’t great, you won’t feel full for very long. You need a snack bar that can keep you feeling full from protein, fiber, and an added hunger blocker, while tasting absolutely amazing. You need a snack bar that supports your weight loss goals and fits into your day seamlessly. That’s why we created IdealBar. When you’re in need of a quick and delicious snack that’s calorie controlled and that can help block hunger for up to 3 hours, IdealBar has your back! In order to fit your weight loss needs, we formulated the IdealBar to be extremely delicious, help with hunger control, as well as provide beneficial nutrients. IdealBar is a great way to take your weight loss plan with you, on the go! With the power of the hunger-blocker Slendesta, IdealBar helps curb hunger cravings in a snack bar with just 150 calories, or less. With 10 grams of protein and packed with several vitamins and minerals, IdealBar has the nutrients your body needs for energy to last until your next scheduled healthy meal! Plus, IdealBar is made with VitaFiber™, making IdealBar even more filling and easy to digest! Available in several delicious flavors, you'll never have to "cheat" on your diet... but it might feel like you are! Slendesta is a potato protein that helps to curb your hunger for up to three hours. In order for IdealBar to be an effective meal replacement bar, it must give your body what it needs to be healthy. Slow digesting fiber and protein work together to keep you fueled and energized for hours. IdealShape Protein Blend (Soy Protein Nuggets (Soy Protein Isolate, Rice Flour, and Salt), Soy Protein Isolate), IdealShape Hunger Blend (Isomalto-Oligosaccharide, (Potato Protein Extract, Potato Maltodextrin)), Peanut Coating (Sugar, Palm Kernel Oil, Partially Defatted Peanut Flour, Nonfat Dry Milk Solids, Peanut Oil, Salt, and Soy Lecithin (as Emulsifier)), Organic Brown Rice Syrup, Chocolate Layer (Glucose, Sugar, Modified Palm Kernel Oil, Glycerine, Natural Chocolate Liquor, Cocoa, Skim Milk Powder, Soy Lecithin, Salted Butter, Sodium Citrate, Salt, Carrageenan, Natural Flavor), Glycerin, Vitamin & Mineral Fortification (Palmitate, Cholecalciferol, DL-Alpha-Tocopheryl Acetate, Biotin, Niacinamide, Calcium D-Pantothenate, Thiamin Mononitrate, Cyanocobalamin, Riboflavin, Pyridoxine, Ascorbic Acid, Phytonadione, Dicalcium Phosphate, Chromium Chloride, Copper Gluconate, Potassium Iodide, Ferric Orthophosphate, Magnesium Oxide, Magnesium Phosphate, Manganese Gluconate, Sodium Molybdate, Sodium Selenite, Zinc Oxide), Peanut Flour, Peanut Oil, Natural & Artificial Flavors, Sea Salt, Soy Lecithin (as Emulsifier). Contains Milk, Soy, and Peanuts. May also contain eggs, peanuts, tree nuts, and wheat. IdealShape Protein Blend (Soy Protein Nuggets (Soy Protein Isolate, Rice Starch), IdealShape Hunger Blend (Isomalto-Oligosaccharide, (Potato Protein Extract, Potato Maltodextrin)), Organic Brown Rice Syrup, Dark Chocolate Flavored Coating (Sugar, Fractionated Palm Kernel Oil, Cocoa Processed with Alkali, Lactose, Palm Oil, Soy Lecithin, and Vanilla), Vanilla Layer (Glucose, Water, Modified Palm Kernel Oil, Sugar, Skim Milk Powder, Soy Lecithin, Glycerine, Natural Flavor, Sodium Citrate, Salt, Carrageenan), Glycerin, Vitamin & Mineral Fortification (Palmitate, Cholecalciferol, DL-Alpha-Tocopheryl Acetate, Biotin, Niacinamide, Calcium D-Pantothenate, Thiamin Mononitrate, Cyanocobalamin, Riboflavin, Pyridoxine, Ascorbic Acid, Phytonadione, Dicalcium Phosphate, Chromium Chloride, Copper Gluconate, Potassium Iodide, Ferric Orthophosphate, Magnesium Oxide, Magnesium Phosphate, Manganese Gluconate, Sodium Molybdate, Sodium Selenite, Zinc Oxide), High Oleic Sunflower Oil, Sea Salt, Natural Flavor, Vanilla Extract, Soy Lecithin (as Emulsifier). Contains Milk and Soy. May also contain eggs, peanuts, tree nuts, and wheat. IdealShape Protein Blend (Soy Protein Nuggets (Soy Protein Isolate, Rice Flour, and Salt), Soy Protein Isolate), IdealShape Hunger Blend (Isomalto-Oligosaccharide, (Potato Protein Extract, Potato Maltodextrin)), White Chocolate Coating (Sugar, Fractionated Palm Kernel Oil, Non Fat Milk Powder, Whey Powder, Soy Lecithin (as Emulsifier), and Vanilla), Organic Brown Rice Syrup, Caramel (Glucose, Sugar, Water, Modified Palm Kernel Oil, Skim Milk Powder, Whey Protein Concentrate(contains Soy), Glycerine, Salt, Soy Lecithin, Carrageenan, Natural Flavor), Glycerin, High Oleic Sunflower Oil, Vitamin & Mineral Fortification (Palmitate, Cholecalciferol, DL-Alpha-Tocopheryl Acetate, Biotin, Niacinamide, Calcium D-Pantothenate, Thiamin Mononitrate, Cyanocobalamin, Riboflavin, Pyridoxine, Ascorbic Acid, Phytonadione, Dicalcium Phosphate, Chromium Chloride, Copper Gluconate, Potassium Iodide, Ferric Orthophosphate, Magnesium Oxide, Magnesium Phosphate, Manganese Gluconate, Sodium Molybdate, Sodium Selenite, Zinc Oxide), Cinnamon, Natural Flavor, Sea Salt, Vanilla Extract, Soy Lecithin (as Emulsifier). IdealShape Protein Blend (Soy Protein Nuggets (Soy Protein Isolate, Rice Flour, and Salt), Soy Protein Isolate), IdealShape Hunger Blend (Isomalto-Oligosaccharide, (Potato Protein Extract, Potato Maltodextrin)), Dark Chocolate Coating (Sugar, Fractionated Palm Kernel Oil, Cocoa Processed with Alkali, Lactose, Palm Oil, Soy Lecithin, and Vanilla), Organic Brown Rice Syrup, Chocolate Layer (Glucose, Sugar, Modified Palm Kernel Oil, Glycerine, Natural Chocolate Liquor, Cocoa, Skim Milk Powder, Soy Lecithin, Salted Butter, Sodium Citrate, Salt, Carrageenan, Natural Flavor), Glycerin, High Oleic Sunflower Oil, Vitamin & Mineral Fortification (Palmitate, Cholecalciferol, DL-Alpha-Tocopheryl Acetate, Biotin, Niacinamide, Calcium D-Pantothenate, Thiamin Mononitrate, Cyanocobalamin, Riboflavin, Pyridoxine, Ascorbic Acid, Phytonadione, Dicalcium Phosphate, Chromium Chloride, Copper Gluconate, Potassium Iodide, Ferric Orthophosphate, Magnesium Oxide, Magnesium Phosphate, Manganese Gluconate, Sodium Molybdate, Sodium Selenite, Zinc Oxide), Cocoa Powder, Cocoa Extract, Natural Flavor, Sea Salt, Vanilla Extract, Soy Lecithin (as Emulsifier). IdealShape Protein Blend (Soy Protein Nuggets (Soy Protein Isolate, Rice Flour, and Salt), Soy Protein Isolate), IdealShape Hunger Blocker Blend (Isomalto-Oligosaccharide, (Potato Extract, Potato Maltodextrin)), Greek Yogurt Flavored Coating (Sugar, Palm Kernel Oil, NonFat Dry Milk, Greek Yogurt Powder (NonFat Milk Solids, Culture, Lactic Acid, and Natural Flavor), Lactic Acid, Soy Lecithin, Natural Flavor), Organic Brown Rice Syrup, Strawberry Layer (Glucose, Sugar, Modified Palm Kernel Oil, Water, Skim Milk Powder, Glycerine, Natural Flavor, Strawberry Juice Concentrate, Soy Lecithin, Carrot and Black Currant Juice for colour, Salted Butter, Salt, Sodium Citrate), Glycerin, Vitamin & Mineral Fortification (Palmitate, Cholecalciferol, DL-Alpha-Tocopheryl Acetate, Biotin, Niacinamide, Calcium D-Pantothenate, Thiamin Mononitrate, Cyanocobalamin, Riboflavin, Pyridoxine, Ascorbic Acid, Phytonadione, Dicalcium Phosphate, Chromium Chloride, Copper Gluconate, Potassium Iodide, Ferric Orthophosphate, Magnesium Oxide, Magnesium Phosphate, Manganese Gluconate, Sodium Molybdate, Sodium Selenite, Zinc Oxide), Beet Juice Concentrate, Natural Flavor, High Oleic Sunflower Oil, Sea Salt, Vanilla Extract, Soy Lecithin (as Emulsifier). IdealShape Protein Blend Soy Protein Nuggets (Soy Protein Isolate, Rice Flour, and Salt), Soy Protein Isolate (isolated soy protein, soy lecithin) IdealShape Hunger Blend Isomalto-oligosaccharide, (potato extract, potato maltodextrin) Greek Yogurt Flavored Coating (sugar, palm kernel oil, nonfat dry milk, greek yogurt powder (nonfat milk solids, culture, lactic acid, and natural flavor), lactic acid, soy lecithin, natural flavor), Organic Brown Rice Syrup, Blueberry Flavored Layer (glucose, sugar, modified palm kernel oil, water, skim milk powder, glycerine, blueberry juice concentrate, organic flavor, soy lecithin, fruit and vegetable juice, butter, salt, sodium citrate), Glycerin, Vitamin & Mineral Fortification (palmitate, cholecalciferol, dl-alpha-tocopheryl acetate, biotin, niacinamide, calcium d-pantothenate, thiamin mononitrate, cyanocobalamin, riboflavin, pyridoxine, ascorbic acid, phytonadione, dicalcium phosphate, chromium chloride, copper gluconate, potassium iodide, ferric orthophosphate, magnesium oxide, magnesium phosphate, manganese gluconate, sodium molybdate, sodium selenite, zinc oxide), Natural Flavor, High Oleic Sunflower Oil, Sea Salt, Vanilla Extract, Soy Lecithin (as emulsifier). Slendesta is the "secret," key ingredient in IdealShake and IdealBar that helps you control your cravings! How does it work? Slendesta is derived from a potato protein extract called Proteinase inhibitor 2 or P2. Found just beneath the potato's skin, this extract stimulates an increased bodily release of cholecystokinin or CCK. CCK tells the brain that the body is full and satisfied. Since Slendesta is not a stimulant, it won't conflict with your body's natural metabolism or give rise to jitters. There are two essential elements to losing weight. First, in order to lose weight you have to be able to control your appetite and reduce the amount of calories you consume. The second essential element is that you have to be able to stick to your plan in order to see results. ldealBar helps you achieve both of these goals. Even though IdealBar tastes like a decadent candy bar, it's only 150 calories or less. With five different tantalizing flavors, you'll always be able to satisfy your sweet tooth anytime, anywhere. One of the most effective ways to maintain a healthy metabolism that consistently burns calories and regulates your weight is to eat 5 smaller meals a day. Although this does not mean you have to cook 5 times a day, it can still seem like a lot of work to prepare 5 meals a day. This is where the IdealBar can make a real difference. 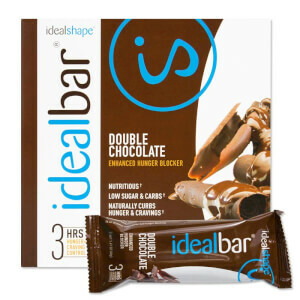 IdealBar is best incorporated in a 5-meal-a-day plan. Eat this bar between your regular meals to continue blocking your hunger and keep your metabolism working. See our complete weight loss plans. Maintaining a regular meal schedule is often tricky to do with a busy lifestyle. The problem is that having an inconsistent eating schedule is very hard on the body. Many people gain weight due to inconsistent meal times and overeating at those irregular meals. Whether you’re at work or on the go, IdealBar gives you the ability throughout the day to stay on track with your weight loss goals. Simply pack a snack bar in your bag or purse and eat it between prepared meals. Increase your energy and benefit from the vitamins and minerals, while keeping your calorie intake low and your metabolism working! © 2019 IdealShape | All Rights Reserved.